Keep your preschooler excited throughout your homeschooling day with the fun-filled Horizons Preschool Student Workbook 2. Eye-catching lessons correlate with lesson plans 91-180 in Horizons Preschool Teacher's Guide 2 and reinforce concepts in Bible, math, language arts, science, social studies, and other subject areas. You'll be amazed as this curriculum teaches your little one how to alphabetize letters, classify human cell structures, count with pennies, determine colors and shapes, and more! And as your child completes each worksheet filled with games, puzzles, and other hands-on learning activities, he'll develop a wonder of God's creation and a lifelong love of learning. What could be more exciting? Give your homeschool child the early childhood education that he deserves. 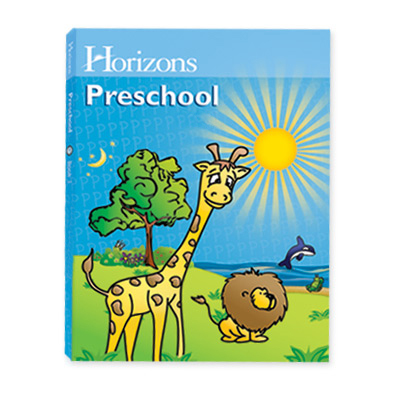 Prepare him for kindergarten with the Horizons Preschool Student Workbook 2 from Alpha Omega Publications. Order yours today and start your homeschooling journey right!